New Mexico is the fifth largest state in the United States. It borders states of Arizona, Texas, Colorado, Utah, and Oklahoma. It also shares an international boundary with the Mexican states of Chihuahua and Sonora. 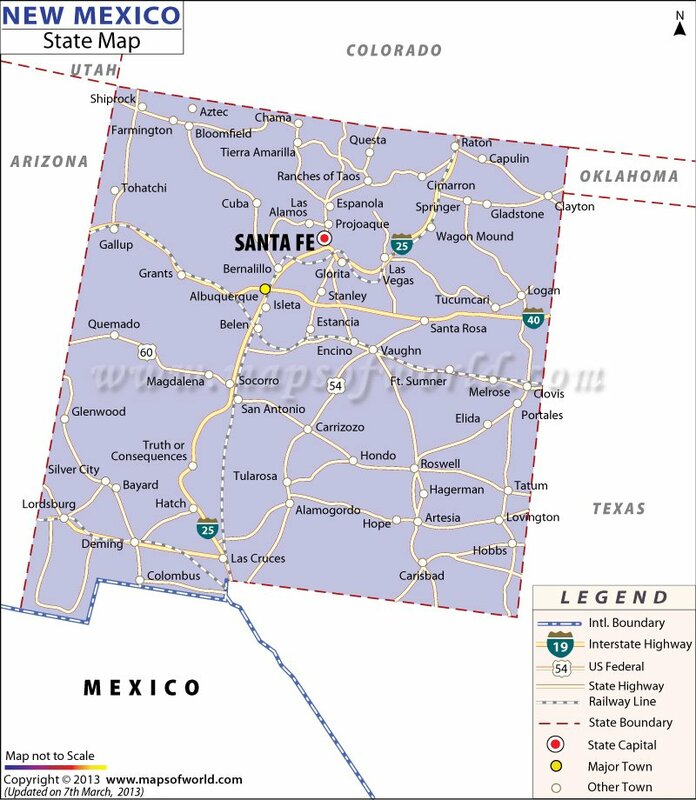 Its latitude is 31° 20' N to 37° N and longitude is 103° W to 109° 3' W.
Also known as "Land of Enchantment", the state of New Mexico lies in the southeastern United States. The state is famous for expansive deserts, rugged flat-topped hills, the hit AMC series Breaking Bad, and cultural heritage with strong Hispanic and Native American influences. Santa Fe is the state capital while Albuquerque is the largest city in the state. Farmington, Roswell, and Rio Rancho are other cities in New Mexico worth visiting. Albuquerque International Sunport (ABQ) is the busiest airport in New Mexico. Amtrak's Southwest Chief, Texas Eagle, and Sunset Limited serve the state. Interstate Highways I-10, I-25, and I-40 along with U.S. Highways form a dense road network.